Today we are featuring an article by Mary T. Guerrant, on the International Day Against Homophobia, Transphobia, and Biphobia. Read below to learn more about this event and how to participate, specifically, 5 way YOU can raise awareness and support for LGBT youth on IDAHOT. The International Day Against Homophobia, Transphobia, and Biphobia (IDAHOT) is May 17th! By: Mary T. Guerrant, MS, a doctoral student at North Carolina State University and a member of APAGS-CSOGD. On May 17, 1990, the World Health Organization declassified homosexuality as a mental disorder, and since 2005 the International Day Against Homophobia, Transphobia, and Biphobia (IDAHOT) has commemorated that day. It is a global occasion for individuals, groups, and organizations to take action on topics related to lesbian, gay, bisexual, and transgender (LGBT) individuals and to advocate for more accepting public policies. Each year a global focus for IDAHOT is chosen and this year’s is LGBT youth. 1. Inform yourself. 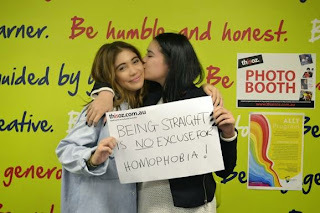 Check out the official website for IDAHOT, where you can learn about what different groups worldwide are doing to raise support and awareness for LGBT youth and you can also follow IDAHOT onTwitter (@May17IDAHOT) and Facebook. 2. Take social media by storm. Join the IDAHOT Thunderclap campaign. Thunderclap is a service that you give permission to post a preset message on your social media pages on May 17 in honor of IDAHOT. When multiple people post on Facebook and Twitter at the same time, it creates a bigger buzz. 4. Support fellow LGBT graduate students. Tell your peers what is out there and specifically for them. The APAGS Committee on Sexual Orientation and Gender Diversity has long been advocating on behalf of this community. It currently offers a set of free training webisodes on special topics (e.g., coming out to your clients), a climate guide (PDF) and a survival/resource guide, an academic-year mentoring program, two grants (one for training and the other for dissertation research), the APAGSLGBT listserv, and much more. 5. Support other youth around the world. Consider donating to the IDAHOT movement and help fund one of several activities worldwide planned, including public marches and demonstrations, publications in national newspapers, festivals, education and public awareness raising, flash mobs, and the support of LGBT rights organizations internationally. APA wants every day to be an IDAHOT day. For more information about how we support LGBT communities and a list of resources for becoming engaged in action, check this page out. Remember, every action counts in the fight for LGBT youth around the world! Thesis editing is critical for students who want assistance with their English speech quality. A fresh and readable thesis that's been professionally edited may substantially improve the odds of its own success. phd proposal writers for hire is the best phd papers writing service provider in my 6 years of experience. International Day Against Homophobia, Transphobia and Bipobia (Idahat) is celebrating International Day. It all marked the mental disorder. But if it is properly counseled to young people, then the problem will be solved a lot. Besides, research grammar checker and corrector should be published in various popular blogs. Help With article writing? Surely this has to be depended upon by the government. Academic writing ought to be the result of a Person's job, and a pupil Should not request yet another writer to 'mend my article'. click here to see more about the quality writing services. World health awareness programs must be welcomed and open to every society. I will click to read more blogs always here.